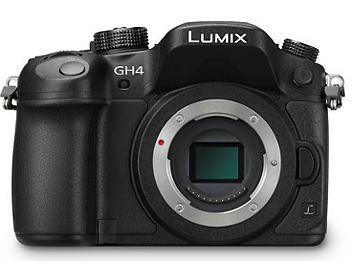 The AG-GH4 can record super-high-definition 4K videos with four times the resolution of Full-HD, such as C4K (Cinema 4K) : 4096 x 2160, 24.00p and 4K (QFHD) : 3840 x 2160, 23.98p/24.00p/25.00p/29.97p onto an SD memory card (U3-compatible SDXC/SDHC Memory Card) in MOV/MP4 file format. Accepts a wide lineup of interchangeable lenses with Micro Four Thirds System compliance. Features Full-Time Auto Focus, Power Zoom and other functions. Newly developed approx. 16 megapixel LiveMos Sensor. MOV/MP4 file format compatible 100 Mbps (H.264, IPB). C4K (Cinema 4K) : 4096 x 2160, 24.00p. 4K (QFHD) : 3840 x 2160, 23.98p/24.00p/25.00p/29.97p. High-quality Full-HD video recording mode. High-quality stereo sound with LPCM recording. VFR (Variable Frame Rate) shooting function, 4x slow-motion capability at max. 96 fps. High-definition, approx. 1040K dot, 3 inches (76.2 mm), Free-Angle, Static Touch Control, OLED monitor. High-definition, approx. 2360K dot, OLED Live View Finder. 3.5 mm diameter headphone jack, 2.5 mm diameter remote terminal.